READING’S Abbey Gateway will be revealed next week, following restoration work as part of the £3.15 million Abbey Quarter project. In the exciting count down to the opening of Reading Abbey Ruins in June, Reading Museum is delighted to open up the newly restored Abbey Gateway, which sits next to Reading’s crown court, opposite the Forbury Gardens. Thanks to National Lottery players and a £1.7million grant from the Heritage Lottery Fund (HLF), the gateway has benefitted from vital internal refurbishment and roof repairs, with plans for Reading Museum’s popular Victorian Schoolroom experience to move into the space in September 2018. The Abbey Gateway will be open for special events, such as history tours, during the summer. The Abbey Gateway launch is the second event in a series of major openings as part of the Reading Abbey Revealed project, with the Museum’s new Abbey gallery which opened in February and the Abbey Ruins due to open on 16th June 2018. There will be a private celebratory evening launch event on Thursday 12th April, where the Mayor of Reading, Cllr Rose Williams, will unveil a commemorative panel describing the gateway’s important history. Members of the public can visit the Abbey Gateway on Saturday 14th April from 10:30am to 3:30pm for free drop in craft sessions and for pre-booked gateway history tours. Cllr Tony Page, Reading’s Lead Member for Strategic Environment, Planning & Transport, and Deputy Leader, said: “I’m delighted to finally see the newly restored Abbey Gateway open to the public. The building has a rich and varied history, including its claim to fame as the former classroom of the writer Jane Austen. It will make a fitting space for the museum’s popular Victorian classroom experience. “This of course, would not be possible without money raised by National Lottery players, and the Heritage Lottery Fund’s recognition the importance of the Reading Abbey Revealed project. I’d also like to say a big thank you to all those involved in the restoration of this beautiful building, in particular CRL Restoration for all their expert conservation work and a special thank you to the Friends of Reading Abbey for supporting our launch event. Kevin Jones, Head of Conservation at CRL Restoration said: “It has been an honour and a privilege to work on this iconic building with such a passionate and dedicated team from Reading Borough Council, the Heritage Lottery Fund and the conservation architects from Hampshire County Council. The collaborative approach from all parties has been wonderful, enabling us to deliver a first class project on time, within budget and to the client’s delight. · The Abbey Gateway was one of only two complete buildings that survived the dissolution of the original Abbey back in 1538 (The other being the other being the dormitory of the Hospitium – which was a lodging house for visiting pilgrims, still located today off St. Laurence’s Churchyard). · The gateway was originally designed to mark the division between the public and private areas of the Abbey precinct. · In the abbey period there was a small room on the ground floor where a porter could shelter from the weather, watch for visitors and keep the inner abbey secure. It is thought the abbot used the upper gateway for meetings. · The gateway overlooks the place where the last Abbot of Reading, Hugh Cook Faringdon, accused of treason by Henry VIII, was publically hung, drawn, and quartered in 1539. · In the 1560s, Queen Elizabeth I turned the abbot’s house, which stood just through the gateway, into a royal palace. After Elizabeth’s death, the palace fell out of use and eventually new houses were built alongside the gateway. · In the 18th century one the adjoining buildings was home to the Reading Ladies’ Boarding School, which used the gateway as a classroom. From 1785-86 a particularly talented pupil studied here: the future novelist Jane Austen. · The building was originally restored by leading architect George Gilbert Scott back in 1861 after a thunderstorm caused the archway to collapse. Photo opportunity: The media are welcome to attend the event from 6.30pm on Thursday 12th April. Please contact Victoria.Nickless@reading.gov.uk to confirm your attendance. The majority of repairs to the external parts of the building have been completed enabling the removal of the full scaffold to allow everyone to see the full extent of the Abbey Gateway. However, roof repairs will continue to take place after 16th April, requiring a small scaffold on the side, but will not affect the opening of the interior of the building to tours and activities during the Easter period. The Abbey Quarter in central Reading brings together nationally important heritage within the former grounds of Reading Abbey, once one of Europe’s largest royal monasteries. The conservation of the Grade I listed, scheduled Abbey Ruins and Abbey Gateway are central to Reading Council’s vision to transform the Abbey Quarter into a unique historical destination. Reading Abbey Revealed is a major project, made possible through £1.77 million funding support from the Heritage Lottery Fund and match funding of £1.38million from Reading Borough Council. 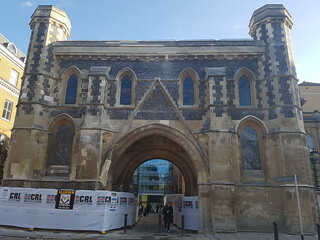 Reading Council appointed CRL Restoration as the main contractor responsible for implementing the conservation side of the Reading Abbey Revealed project in January 2017. The ambitious scope of the project has conserved the remains of Reading Abbey and the Abbey Gateway, and has provided opportunities through events, volunteering and education. Site-wide interpretation of the Abbey Quarter has included the opening of the new Abbey gallery at Reading Museum and will include installing new information points across the town. The accompanying activity programme will continue beyond the Abbey opening until the end of 2020.